Boyfriend Beach, along with its surrounding bays in northern Irukandji, was a major tourist, admininistration, and business centre. 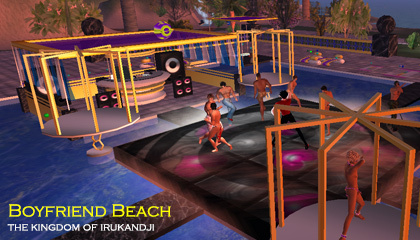 Boyfriend Beach was not a new sim, but a rename and rebuild of the island, Hephaistion, its first incarnation. As the reconstruction project was so extensive, and to make the sim more marketable (people struggled with the spelling), I decided to change its name to Boyfriend Beach. In hindsight, Hephaistion represented the island at its most noble and truest to the Irukandji story, while Boyfriend Beach reduced that a little to become more of a pleasure island. More than anything during the two lives of this sim, I regret the cheesy name change, but it's history now. All of that said, Boyfriend Beach truly was a magnificent island, and everything it set out to be. Most of the island was occupied by an extensive palace district. At its heart was the palace itself, a monolithic marble and sandstone structure called Government House which dominated the island and could be seen from afar in all directions. Acres of lawns and terraced walkways surrounded the building, and an enormous swimming pool, complete with nightclub, filled the western courtyard. Beside the pool stood the Royal Bath House with even more pools plus upstairs pleasure areas. The Maskari River ran through the island from Valkyrie Shoals and into Baie de Citron. Keeping with the opulent theme of the island, the river's entire length was encased in a canal of black marble and gold, which frankly, looked amazing. I loved this theme so much that I continued the canal through the diagonal neighbouring island, Nouvelle Kiribas, thus extending the royal canal all the way to Tamita Bay. Years later when I rebuilt Irukandji on the InWorldz grid, I used the same marble and gold canals around the palace on the new Tamita Island. Finally, beneath this beautifully manicured landscape ran a massive submarine channel called the Royal Aqueduct. It ran 500 metres beneath Boyfriend Beach and the neighbouring sim, Split Rock Mountain. Its outlet was two full regions away in distant Aquitaine Bay. 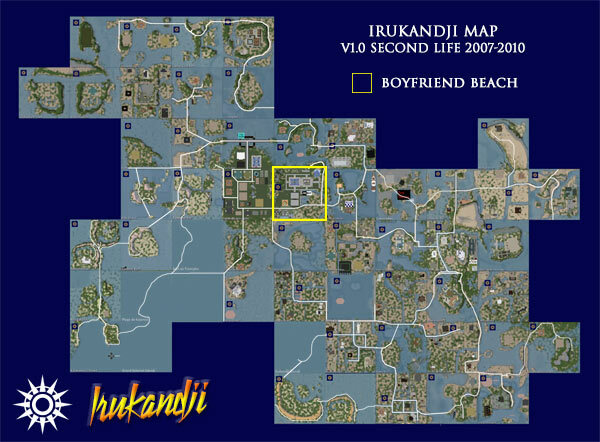 At the time of all this, I was having a few technical and admin difficulties on my main sim, Tamita Island, so Boyfriend Beach temporarily served as the capital of Irukandji for most of 2008. Boyfriend Beach changed shape several times to facilitate new additions and themes but each stayed true to the palatial theme. It was all very regal. Clockwise from the south, neighbouring islands that adjoined Boyfriend Beach were Baie de Citron, Split Rock Mountain, Byron Bay, Palace Lagoon, Valkyrie Island, Valkyrie Shoals, and Nouvelle Kiribas. In late 2008, the effects of new SL pricing coupled with the GFC, forced me to decommission 60% of the estate in the first wave of downsizing. My problems on Tamita Island had fixed themselves, so now Boyfriend Beach was a luxury and had to go. Boyfriend Beach has a massive history, which I will add to here at some future point, and I know there are many people out there in the real world who remember it fondly. Below you will find some more photographs of Boyfriend Beach that I took during my travels around the islands.